In the 1970’s we used to subscribe to a Hindi newsmagazine called “Dinman”. This was a serious news magazine from the Bennet Coleman stable. Like most other decent publications from the publishing house (remember Parag, Dharmyug, Madhuri and Illustrated Weekly of India? ), this magazine too is defunct now. Dinman was my Urdu teacher! This magazine ran serialized tutorials on different languages; Bengali, Urdu, Gujarati, Oriya etc. Don’t ask me why a news magazine was teaching languages, but what a blessing this was! And don’t even ask what a kid like me (I was around 14 years then) was doing reading Dinman, least of all learning languages as a hobby! Of all the languages taught, Urdu caught my fancy. For no particular reason. What really got me hooked was the teacher’s style; he taught the script via Devnagari! Urdu as a derivative of Devnagari was his theme. And he did not start the usual way by teaching alphabet alif, bey, pey Take, for example, his initial lesson. He explained that the Urdu “R” was a twin of its Hindi cousin. Urdu, as we all know is a “right-to-left” script; So, Urdu R (called “ref”) he said, was a mirror image of the Hindi R. And since Urdu is a script which is written very rapidly, superfluous strokes are dispensed with to accelerate the speed. Just like stenography. Hence the horizontal stroke above the Hindi R was dropped for ease of speedy writing. So the mirror image of Hindi R minus the “hat” becomes the Urdu R. Simple! 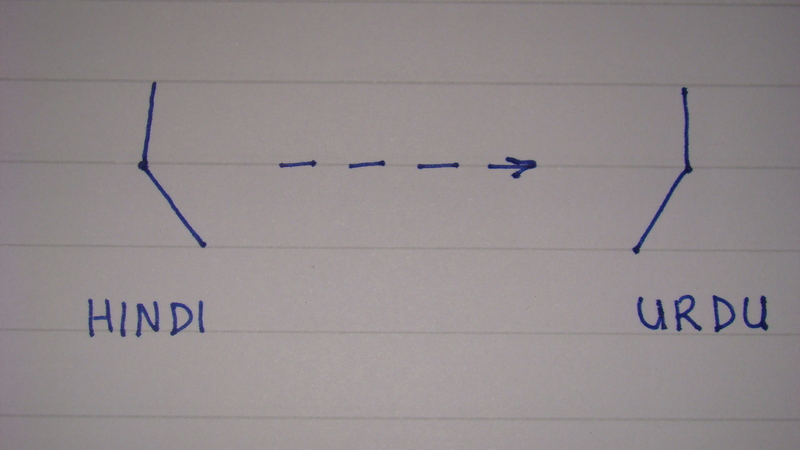 To convert R and D to Ra and Da, one needs to only add a vertical stroke (the famous Urdu “alif”) next to the alphabet. Just as in Hindi. 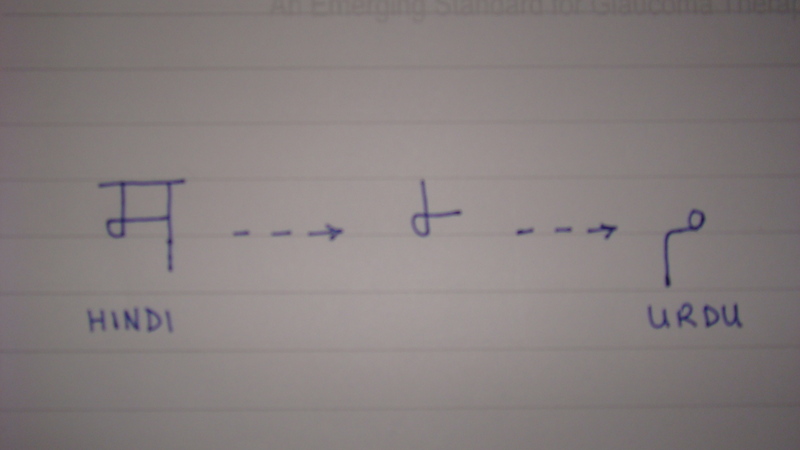 (The mirror image of the Devnagari aakar will remain a top-to-down vertical stroke!). Just take care to add the stroke to the left of the alphabet instead of right as in Devnagari. 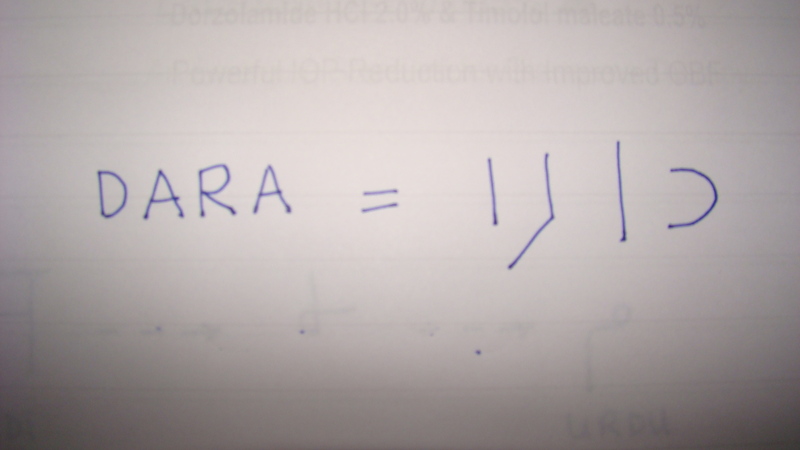 So we could now construct our first Urdu word, albeit a proper noun: Dara! Urdu J? No problem! 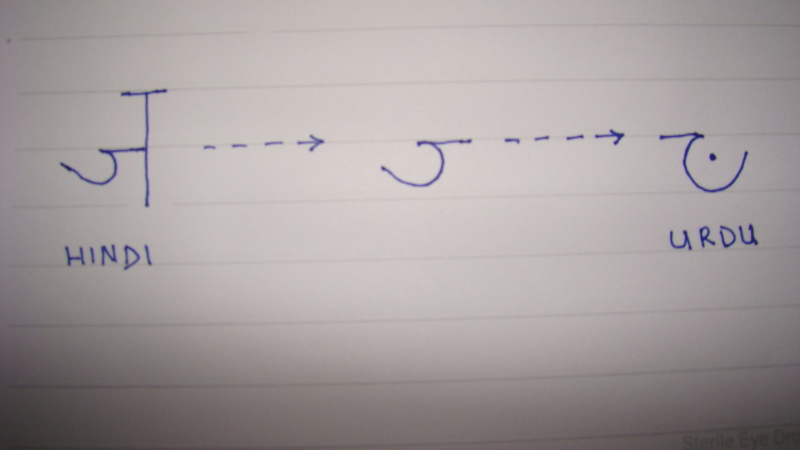 Knock off the horizontal hat and the vertical stroke, take a mirror image and you are close to the Urdu J (“jim”). Just add a dot right in the center of the curved space. After all you are writing Urdu script and a few dots will make the writing aesthetically pleasing! (My observation- it is not what the teacher said). And Cha (called “chim”) was only one step away. Except that there were no mirrors images here, only deletion of the superfluous strokes of the Devnagari “cha”. And 3 beautiful dots nestling right in the center of the curved space. My Urdu teacher was a genius! The mirror-image of the Devnagari “Chandra-bindu” looks the same. The “chandra-bindu” imparts a subtle “N” sound. And this, true enough, is your Urdu N (called “noon”). A simple transpose of the Devnagari M (of course after dropping the superfluous strokes in the alphabet) converts it to the Urdu M (“mim”). And so on and so forth. 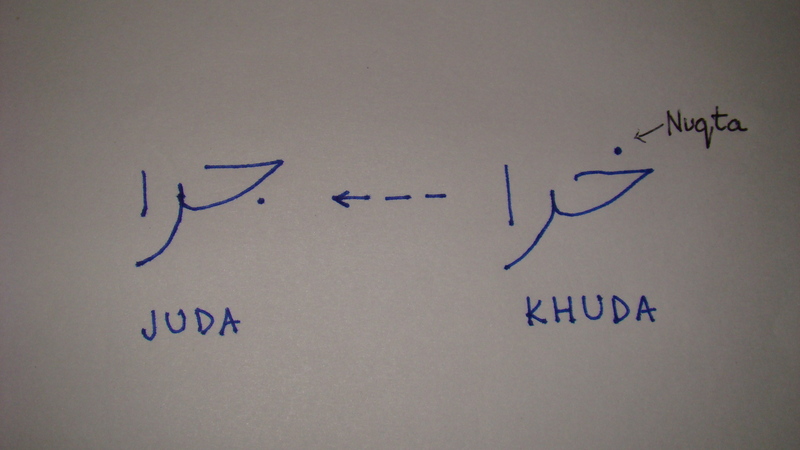 Urdu was becoming fun. I am not for a moment implying all Urdu script is this simple. But once you got hooked on, you would try to conquer this seemingly complex script. And complexities started pretty quickly. Joining alphabet was the basic one. There is an art in writing even a simple word like “shama”. You don’t write simply a “sha” and an “M” and add an alif, the alphabet need to be fused correctly. And you do not even use an alif in spelling shama!Then the choice of multiple alphabet having similar sounds (choose from 3 varieties of Ha sound and 2 varieties of K sound). 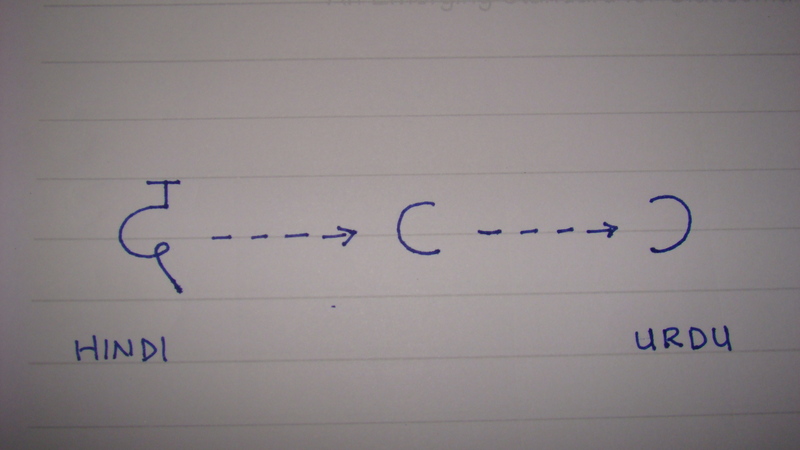 And the struggle to remember to place the dots (nuqta) in the right place. One could make grievous errors here. An example which is also a popular proverb is about a misplaced dot which while writing “Khuda” (God) would convert it to “juda” (separated). Remember the saying “Nuqtey key her-pher sey khuda juda ho gaya”? My father saw me making valiant attempts to learn Urdu, and he decided do something about it. He knows Urdu (in the olden times in the North students would compulsorily study Urdu) and he helped me learn forming the alphabet with the right strokes. Remember I was learning the script without the help of a traditional teacher whose strokes I could copy and learn how to write. More importantly, my father bought me the Urdu text book for Std 1. I think it was called “Dara, Dawar, Rosie”. This was modeled on its Hindi counterpart for Std 1 called “Rani, Madan, Amar”. My mother frowned at this waste of time in learning what in her opinion was a useless language, but both my father and I enjoyed these learning sessions. As I learnt more, I began to harbor secret ambitions of writing ghazals, I thought it was just a matter of time before India produced its next Ghalib! Ghazals were still far away and my interest in Urdu script did not sustain for too long. Perhaps it had also to do with other diversions I was developing, movies being the major one. And slowly my Urdu lessons slowed and soon halted. But even now, I do remember a fair amount of Urdu script. And this keeps getting revised in strange little ways. For example when on a flight from Hyderabad I chance upon “Siasat” the local Urdu daily, I try my hand at reading the headlines. Pretty tough now for me, but if I know the context of the news item I guess my way through based on some of the characters I recognize. While on a trip to Lahore last year, I had a field day impressing my Pakistani hosts about my knowledge of the script by reading aloud the shop sign-boards. I would, in typical neo-literate style, slowly read the word character-by-character and then join them together into a word. Like this: La…. Ho… Ra, Lahore! And the Urdu script comes as the most pleasurable diversion in official meetings! Whenever I get bored, I doodle. Unlike most who would draw Rorschachian figures or worse still moustachioed villains in their notepads, I let my pen flow forming the aesthetically pleasing strokes of Urdu script. Boredom and corporate intricacies then seem far, far way!